OPPO, The Selfie Expert, recently announced the launch of India's biggest eSports Championship, 'Player Unknown's Battlegrounds MOBILE Campus Championship 2018' in partnership with Tencent Games, the world's largest gaming company in India today. The mega eSports tournament will run for a month between September 26 to October 21, 2018, culminating in the grand finale to be held in Bangalore. The championship will be experienced via OPPO's recently launched and breakthrough product - OPPO F9 Pro. 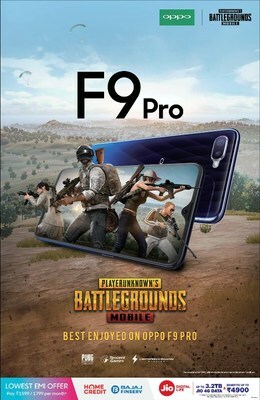 Packed with powerful features, the F9 Pro is set to take the PUBG gaming experience to the next level. For the championship, OPPO has sponsored a prize pool of INR 50 Lakhs that will feature more than 2,000 colleges from 30+ cities across the country. The mega tournament will witness participation of 10,000 teams where each team will have 4 players to play PUBG. The latest addition to the F series - the 6.3-inch bezel-less, 1080*2340 resolution and a super-high screen-to-body ratio of 90.8% 'waterdrop screen' delivers a perfect visual experience to achieve maximum kills as it occupies almost all of F9 Pro except for a small droplet at the top. The AI battery management will enable the gamer to advance to the next level without the hassle of charging the phone in between the game. Moreover, the VOOC Flash Charge which is independently developed by OPPO applies low voltage charging technology and offers a charging speed which is up to four times faster than general charging at 5V/1A. This enables the user to enjoy PUBG even when on the go. OPPO has also introduced consumer benefits by partnering with Home Credit, Bajaj Finserv and Reliance to purchase the OPPO F9 Pro at an EMI as low as INR 1,599/1,799 per month to enjoy data upto 3.2TB on Jio.